While GTbets has only been in operation since 2011, their no nonsense straight forward approach to how they do business is a breath of fresh air making them a very attractive option to players from all over the world including the US. They just get it and don't monkey around with players like many other sites do. With one of the most attractive signup bonuses in the industry, fast and reliable payouts and fantastic ongoing promotions, it's easy to see why GTbets is a big hit with players. GTBets has been around for several years now and have a very solid reputation. We love them because they are a nononse sportsbook that comes correct in every way. For example their bonus offer is straight cash, no freeplay nonsense and their terms are more than reasonable. And when you want to collect, GTBets pays out very quickly and doesn't make you jump through a bunch of hoops like other sites do. GTBets has been a refreshing surprise in an industry that has it's share of untrustworthy sites and we are sure you will love them as much as we do. Licensing And Certification - Is GTBets Sportsbook Legal In the USA? At GTbets you will find frequent, straight forward bonuses without a hidden "catch", including the BEST Sign Up Bonus in the industry! On your first deposit upon sign up you will get a 100% cash bonus up to $250, or a 50% cash bonus up to $500 for larger deposits. This sign up bonus, as well as all reload bonuses at GTbets, are CASH bonuses, meaning players will keep both the wager and win amount when playing with them. Free Play Bonuses are commonly offered by many other well-known industry books, however these only allow the player to keep the win amount, therefore making the bonus half as valuable as a cash bonus. The Favorite Teams Point Discounts, which allows players to choose two of their favorite teams in each of these 4 leagues: NFL, College Football, NBA and College Basketball. For each of their favorite teams, players receive a free half point discount every time they bet on that team during the regular season, thus increasing their chances to win at no extra cost. The GameTimeRewards Loyalty Program, where players can earn points for every wager and then redeem those points for either cash, merchandise or sweepstakes. Weekly Casino Rebates, 10% of all casino losses will be offered back as a Cash Bonus every Tuesday. $50,000 Progressive Parlay, where a 15-team parlay for just $5 can pay-out a minimum of $50,000. 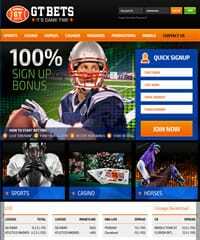 There are a variety of different wagering options available at GTbets as well as a wide range of different International and North American Sports which include the following: NFL Football, NCAA Football, NBA Basketball, NCAA Basketball, Baseball, Hockey, Soccer, MMA/Boxing, Golf, Tennis, Auto, Rugby and Cricket. The wager types include the following: Straight wagers, Moneylines, Parlays, Totals, Teasers, Round Robins, Point Buy/Sells, If bets and Progressive Parlays. GTbets also offerings wagering on Half Times, Quarters, 1st 5 Innings, Run in the 1st, Futures, and Propositions. They also offer a robust Live In-Game wagering product. They have also recently introduced a fantastic new Mobile wagering site, which is available on iPhone, Android, Windows Phone and Tablets, and allows players to place bets in Sports and Casino without any limitations. Though GTbets is known for its premier sports product, the fact of the matter is that they also offer a Casino wagering product that rivals anyone in the industry. Operating on both BetSoft and ArrowsEdge casino software, GTbets is able to provide clients with a unique combination of both desktop and mobile casino games that no other brand in the industry is able to offer. High jackpots and random progressives give players the chance at hitting it big at any moment! GTbets offers a Live in-Game Betting system for Football, Baseball, Basketball, Soccer, Hockey and Tennis. This interactive system allows players to get right in the action of the game and base their wagers on up to the minute plays. It creates a much more exciting and dynamic way of betting, which can help increase the accuracy of your wagers, thus saving and making you more money in the long run. GTBets offers a great variety of deposit options to their players. All major credit cards are accepted, as well as BitCoin and person to person transactions. Other accepted payment methods include, Skrill and Neteller, just keep in mind that deposits made with Neteller or Skrill only qualify customers for a 50% Cash Signup Bonus up to $500 as per their terms. GTbets is highly praised throughout the online sportsbook player community for their speed of handling payouts. The team handles all payout requests quickly and professionally and a manager is always available to customers for and inquiries or payout issues. They know that getting your money quickly and key to having happy customers, so they do their utmost to be the best. Clients can choose from the following payment methods to receive their winnings and cash payouts: Bank Wire, BitCoin, Back2Card, Check by Courier, Cash Methods, Skrill and Neteller. All BitCoin payouts are free of charge, so players using this method can get their money quickly, and without any fees! Is GTBets Sportsbook Mobile Friendly? GTBets offers what is called a responsive website design which basically means it adapts to all smartphone devices automatically. So if you're a player who enjoys betting on the go, GTBets certainly has you covered. Customer service and payments at GTbets are part of what put this sportsbook at the top! Customer Service reps are highly experienced and willing to handle any and all inquiries quickly and with accurate up to date information. Escalations and troubleshooting can also be handled by all support agents, thus avoiding time being transferred to other departments. GTbets offers a top notch service for the best user experience possible. They have a high quality product, including a state of the art website and mobile betting interface, as well as a wide variety of sports, casino and horse betting options. Their promotions are second to none and extremely straight forward, no gimmicks or strings attached. They have an experienced customer service staff, who are capable of handling any and all inquiries or technical issues. When it's time to get paid, GTbets is going to make it a quick and painless experience, and free of charge depending on the method. The only reason we gave them 4 stars instead of 5 is because they just haven't been around as long long as some of the other sites that have a proven track record.